C-Line's long lasting; attractive recycled project folders will make your project extremely easy and organize. The strong, tear-resistant recycled folders are sealed on two sides with an easy loading and access system. Polypropylene material means there are no photocopy transfer giving the best protection for your hard work. Reduced glare finish uses a special resin combined with an embossing pattern to absorb reflected light and eliminate glare. With at least 70% material diverted from the solid waste, C-Line truly provides an innovative premium product for any type of use. These report covers and project folders can help you work smarter! Welcome to MyBinding video. 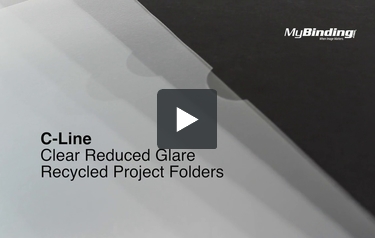 Let's have a little gander with C-Line's Clear Reduced Glare Recycled Project Folders. C-Line's long lasting attractive recycled project folders will make your projects extremely easy and organized. The strong, tear resistant, recycled folders are sealed on two sides with an easy loading and access system with plenty of room for large documents. Polypropylene job means that there are no photocopy transfers and give you the best protection for your hard work. For more demos, reviews, and how-to's, check out MyBinding.com.